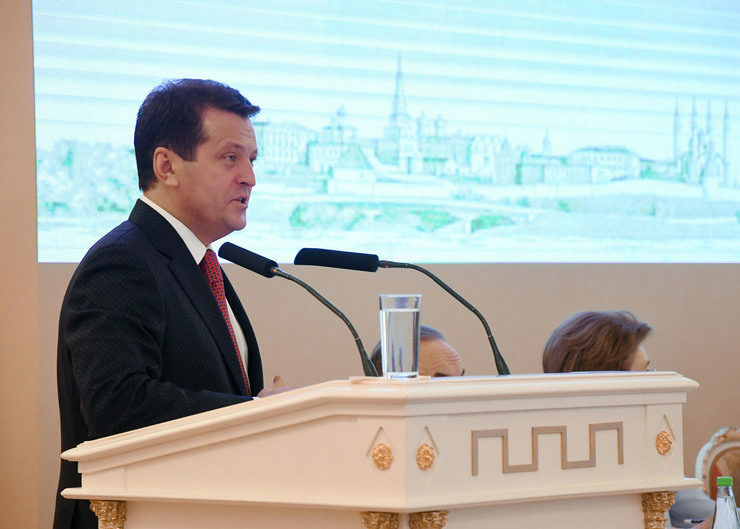 The speech by the Mayor of Kazan at the XVII session of the Kazan City Duma. We consider the issue of the development of culture in Kazan at sessions of the Duma systematically, since culture is an important component that shapes the way of citizens’ life. Today, Kazan is becoming a city with a worldwide name thanks to large-scale international events, and cultural trends should match this status. We heard in the report and speeches that new creative collectives of different ages appeared, as well as new traditions that went out in large scale to urban areas: yards, parks, squares, and streets of the city. We created the Directorate of Parks and Squares in order to organize this work. In general, specialists of municipal cultural institutions work with the population. Their unselfish interest in their work, a great love for the creativity that they create amazes sometimes. Today I especially want to say words of gratitude to the employees of municipal cultural institutions: art and music schools, libraries, children's clubs, houses of culture, leaders of creative groups both children's and adults. Thank you for your work, for your contribution to the cultural life of our capital, and for your new creative success! We also say words of gratitude to all cultural institutions. Theaters play a huge role in the life of the city. The theatrical life of the city is a special world. Theatrical groups with their creativity increase the craving for theater in Kazan from year to year, especially among young people. <...> I thank the theatrical and creative collectives, the museums of the RT, the Ministry of Culture for your active participation in the creation of all modern conditions for citizens and the creation of attractiveness and recognition of our city beyond its borders. <...> We have already said that the cultural traditions of the city are strong and continuous throughout the long history of the city. It is important that, despite the various difficult periods of the country's life, the system in the field of culture is preserved in our city thanks to the far-sighted policy of our leadership. No school of art was closed. Moreover, the departmental houses of culture were accepted for maintenance at the expense of the municipal budget. Today, these are the largest houses: the HoC “Stroiteley” – the Cultural Center “Saidash”, the HoC of Lenin, the HoC of Uritsky – the Cultural Center “Moskovsky”, the HoC of Said-Galeev. Things are humming in them even now. Creative teams of different ages are engaged. Residents love these institutions and they go there with great pleasure in their spare time. <...> Rustem Minnikhanov, the President of the RT, decided to overhaul the three houses of culture: the Lenin, the Uritsky, and the “Chulpan”. And we need to do the same for all other houses of culture. Just budget means are not enough. I want to appeal to all those present in the hall, the leaders, colleagues, especially the deputies of the State Council of the RT, who took an active part in this. Take the supervision of the HoC and help us find sponsors. I hope that we will repair all the houses of the city's culture by joint efforts. As for the cultural filling of the public spaces of parks and squares, it is necessary to continue the work begun regarding the organization of the quality of leisure activities in the parks for our citizens. The Executive Committee needs to intensify the activities of the established Directorate of Parks and Squares in order for the citizens to obtain an accessible cultural service in our well-organized parks. <...> Today we instruct the Executive Committee to develop <...>, discuss, and approve a long-term municipal program, taking into account the main directions of the Strategy-2030.